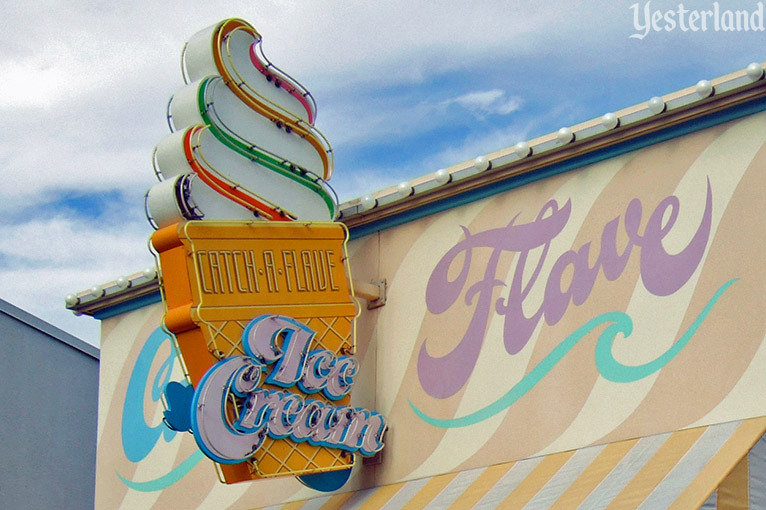 Take a look at the colorful edges on the neon ice cream cone swirls. 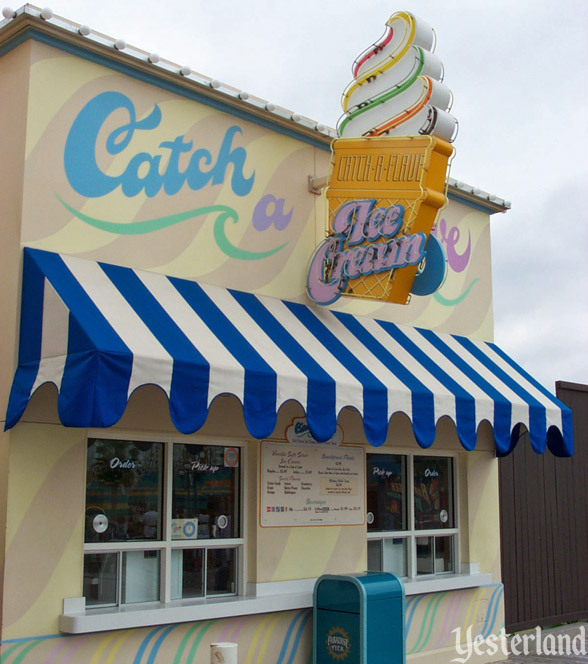 The colors tell you that this place sells vanilla soft serve ice cream with your choice of a colorful flavor swirled in—cotton candy, grape, orange, lemon, butter pecan, bubblegum, strawberry, or chocolate. 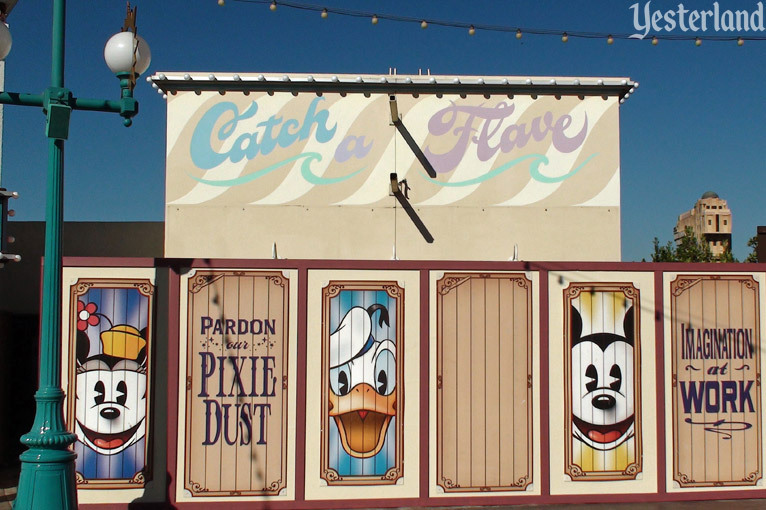 Catch a Flave is on Paradise Pier, right before billboard row—or right afterwards depending on which way you’re circling the lagoon. The building isn’t much to look at. There’s the nicely done neon sign extending out above the order windows, but, beyond that, it’s just a simple stucco box with a striped awning. The painted graphics, with pastel colors and a broad-stroke script, suggest the 1970s more than any other decade. Walk up to the window and place your order. It might be a tough decision. Every flavor goes well with vanilla. With orange, you get a classic “50/50 Bar” taste. Butter pecan, with its caramel-coated nut flavor, comes highly recommended. 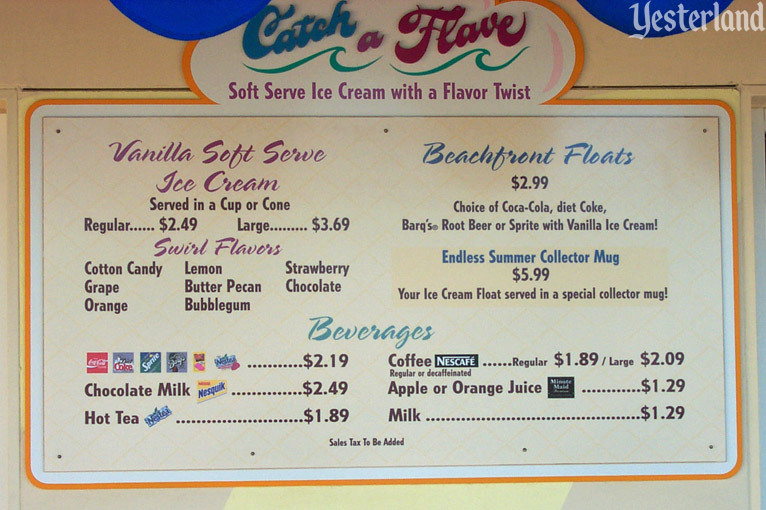 If you can’t make up your mind, ask the cast member to pick a flavor for you. Or get plain vanilla, without a flavor swirled in. Think of it as the ninth flavor. If you think it’s too cold for an ice cream cup, cone, or float, have some hot coffee instead. But don’t count on Catch a Flave being open. 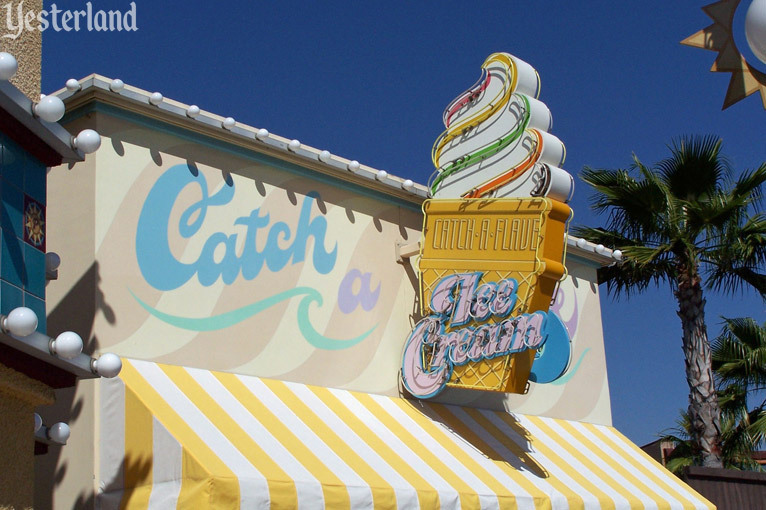 This place tends to shut down when demand for ice cream drops along with the temperature. 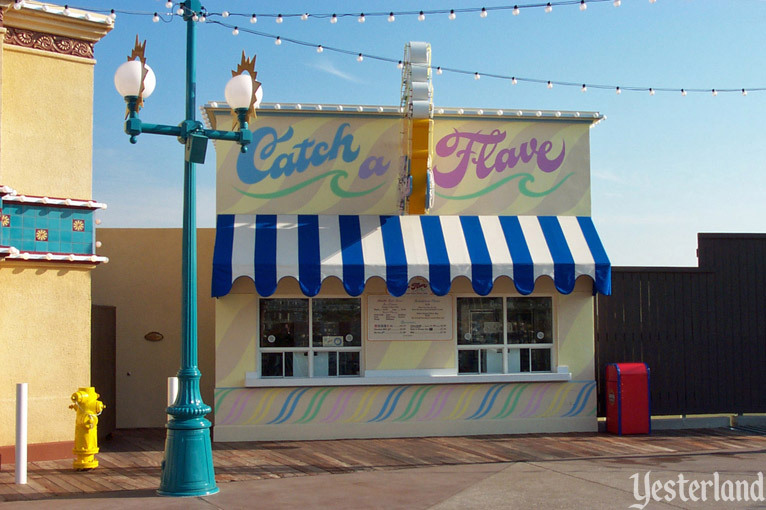 Catch a Flave was part of Disney’s California Adventure when the park opened in February 2001. Odd twist on soft serve ice cream. Some gee-whiz gadgetry allows decadent 10 percent-butterfat ice cream to be laced with various flavor gels, ranging from obvious (chocolate and strawberry) to odd (cotton candy and bubble gum). Presumably, Disney was using standard equipment and syrups from the Flavor Burst Company of Danville, Indiana. Although such flavored, color-edged soft serve was not unique to Catch a Flave, it was unusual. Park guests liked it. 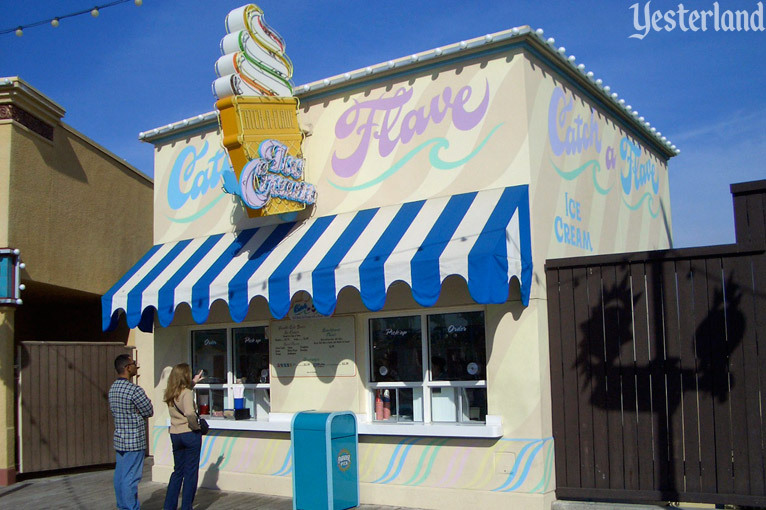 In April 2010, conventional soft serve machines replaced Catch a Flave’s “gee-whiz gadgetry.” The flavor choices became vanilla, chocolate, or vanilla and chocolate swirled together. Period. 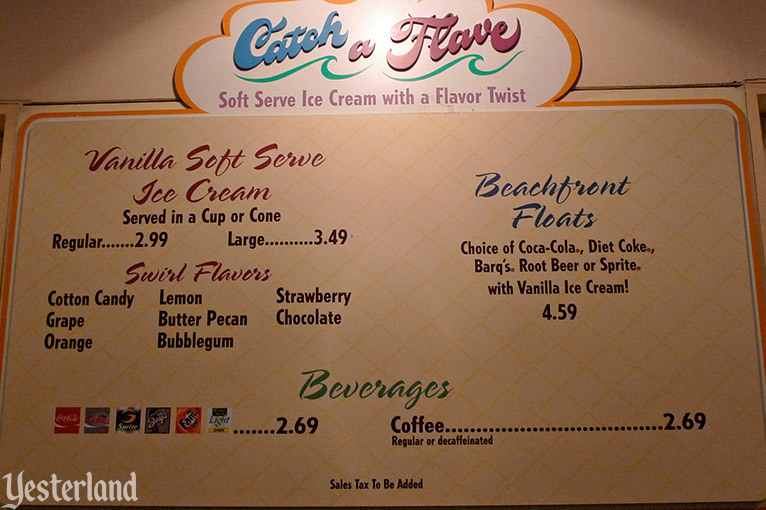 It was still called Catch a Flave for most of 2010, despite the lack of flavor choices. The prices remained the same. At least the soft serve was still tasty. 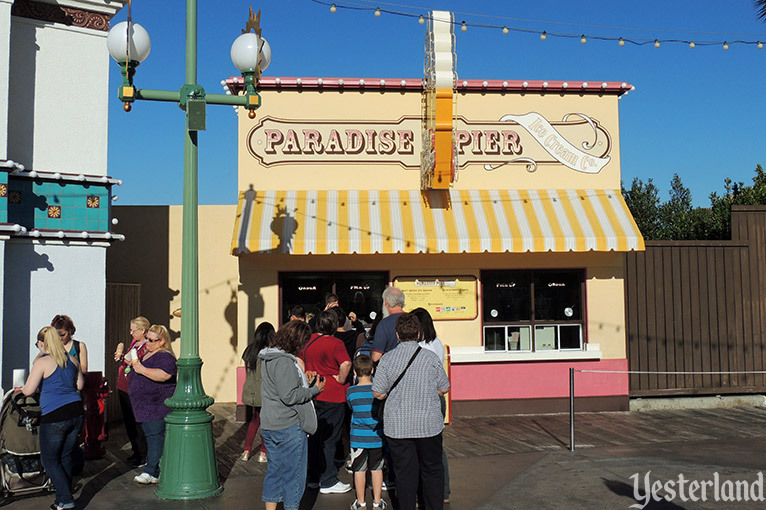 In September 2010, after a short closure, Catch a Flave reopened as Paradise Pier Ice Cream Co.—a more generic name that better reflected its more generic menu. 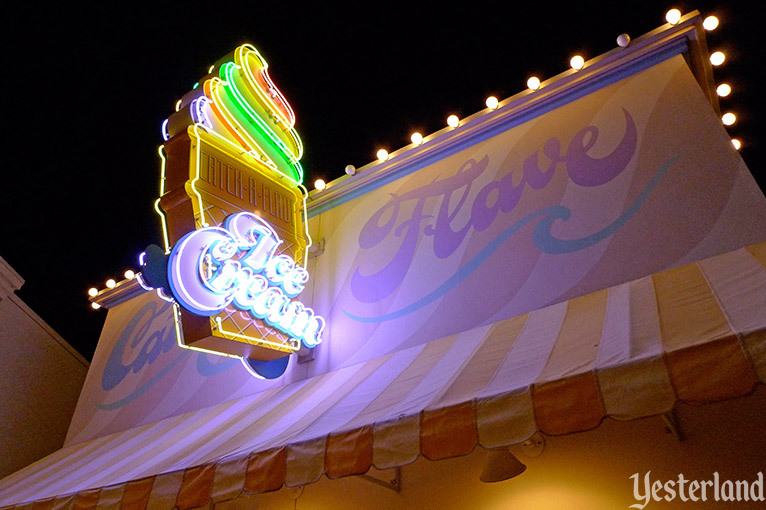 The neon sign from Catch a Flave survived, but as a plain vanilla cone. 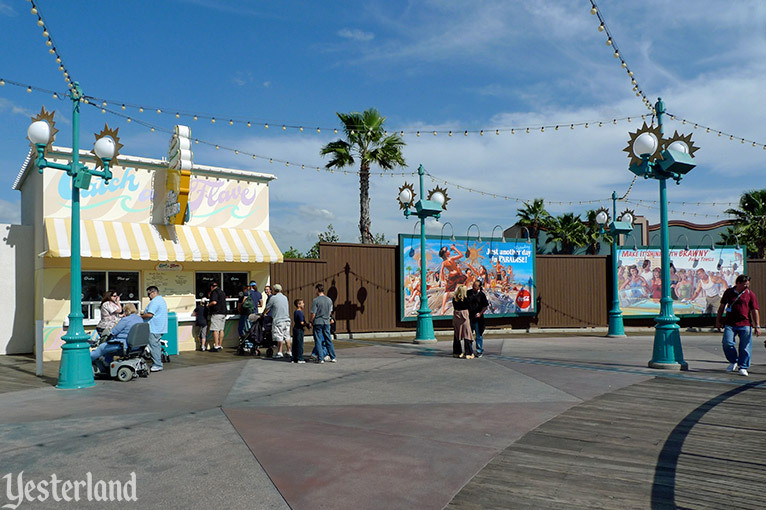 The former Catch a Flave—and its successor Paradise Pier Ice Cream Co.—became Adorable Snowman Frosted Treats in 2018. 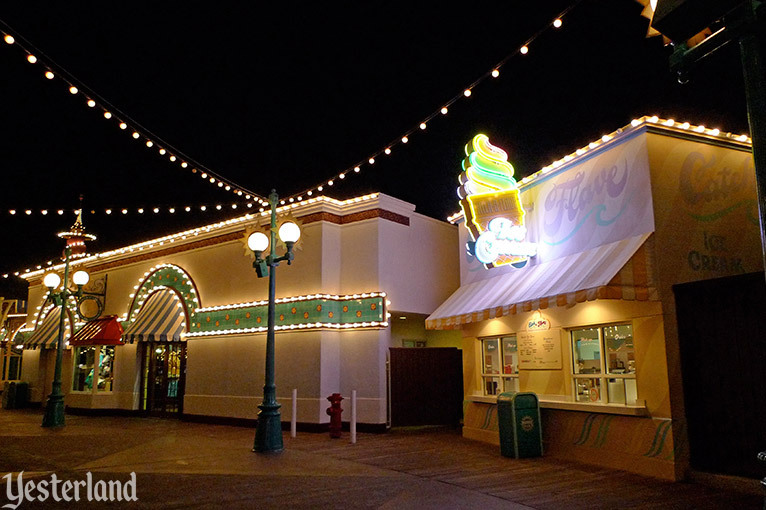 Now, please continue with Paradise Pier Ice Cream Co..